Wasps, mud daubers, birds and rodents pose a serious threat to the furnace on your RV. They can enter through the furnace vents and cause serious damage by building nests that interfere with air flow. 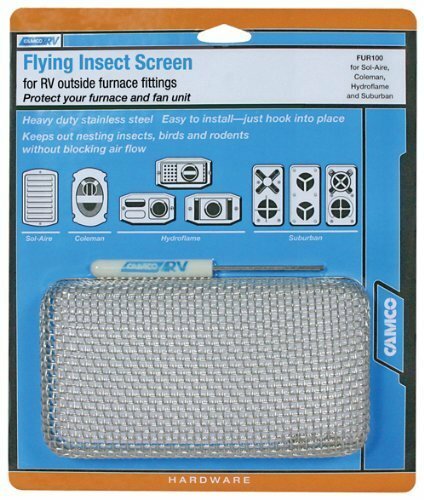 Camco 42140 (Model FUR 100) Flying Insect RV Furnace Screen fits Colman, Suburban, Sol-Aire and Hydroflame furnace vents. As Camco offers several furnace screens, consult size and photos to confirm this screen will fit your furnace. This easy to install screen will help ensure that your furnace vent stays free from costly invasion by unwanted pests.